Our May sale is loaded with better singles, collections and accumulations. 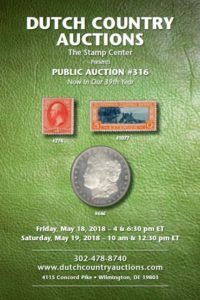 In the cover section there is a nice #17a bisect and many large groups of naval, topical, FDCs, postal stationery, Philippines, cachet makers, air & Zeppelin covers. The U.S. singles boast of a pair of #19 and #22, two #70c, #214 graded 90J, plus a strong showing of Postage Dues and Back of the Book. We have a large number of midsize and larger U.S. collections and accumulations. The coin section features a nice selection of type coins especially Bust Halves, Morgan Dollars, U.S. Gold and classis Commemorative offerings that will appeal to most collectors looking to fill a hole or start a new collection. The balance of our May sale is jam packed with individual country collections, worldwide collections and large lots.